Desafiando a Nomenklatura Científica: O cientista David P. Barash diz que é hora de criar os "chimpahumanos"! O cientista David P. Barash diz que é hora de criar os "chimpahumanos"! 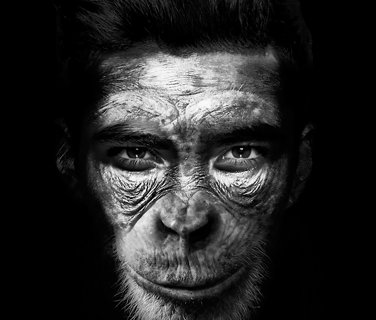 The humanzee is both scientifically possible and morally defensible. The year 2018 is the bicentennial of Mary Shelley’s Frankenstein, subtitled the modern Prometheus. Haven’t we learned that Promethean hubris leads only to disaster, as did the efforts of the fictional Dr. Frankenstein? But there are also other disasters, currently ongoing, such as the grotesque abuse of nonhuman animals, facilitated by what might well be the most hurtful theologically-driven myth of all times: that human beings are discontinuous from the rest of the natural world, since we were specially created and endowed with souls, whereas “they”—all other creatures—were not. It is at least arguable that the ultimate benefit of teaching human beings their true nature would be worth the sacrifice paid by a few unfortunates. On the other hand, it seems equally likely that faced with individuals who are clearly intermediate between human and ape, it will become painfully obvious that a rigid distinction between the two is no longer tenable. But what about those presumably unfortunate individuals thereby produced? Neither fish nor fowl, wouldn’t they find themselves intolerably unspecified and inchoate, doomed to a living hell of biological and social indeterminacy? This is possible, but it is at least arguable that the ultimate benefit of teaching human beings their true nature would be worth the sacrifice paid by a few unfortunates. It is also arguable, moreover, that such individuals might not be so unfortunate at all. For every chimphuman or humanzee frustrated by her inability to write a poem or program a computer, there could equally be one delighted by her ability to do so while swinging from a tree branch. And—more important—for any human being currently insistent upon his or her species’ specialness, to the ultimate detriment of literally millions of other individuals of millions of other species, such a development could well be a real mind expander and paradigm buster.